All of our corsages & boutonnieres are made to order - just for you - so we recommend you come into the store to place your order. Then you can customize your bouquet, not only by flower or color, but by hand selecting your ribbon, bracelet, or any of a wide selection of beads, jewels, feathers and even lights that you'd like! Below are just a few samples of what we offer & a handy guide to creating your own custom corsage. Checkout our prom photo gallery or our Facebook page for more pictures! 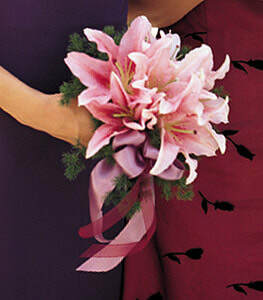 Learn more about creating customized prom flowers here! Multiple colors available for roses and bow. Bracelet shown in White Pearl, available in other colors. Mini carnations, greens, babies breath and a bow. Multiple colors available in mini carnations, bow and bracelet. A mix of flowers (sweetheart roses, mini carnations, daises, alstroemeria; Specify your preference), greens, babies breath and a matching bow. 3 sizes available. 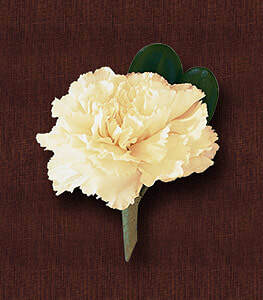 Multiple colors available in mini carnations, bow and bracelet. Roses with fern, babies breath and matching bow. The stems are wrapped in cellophane. 5 sizes available -- 3 roses shown. Multiple colors available in roses. Multiple colors available for bow. Wrapped in cellophane, a bouquet to carry consists of a mix of flowers in a multitude of colors and includes fern, babies breath and a matching bow. A mix of roses, greens, babies breath and a bow. Roses come with their stems exposed, either tied or in a holder. Multiple colors available in roses and bow. A mixture of different types of flowers, greens, and a bow. Flowers come with their stems exposed, either tied or in a holder. Multiple colors available in flowers and bow. A mix of lilies, greens, babies breath and a bow. Lilies come with their stems exposed, either tied or in a holder. Multiple colors available in lilies and bow. A single rose with fern and babies breath. Other colors available. 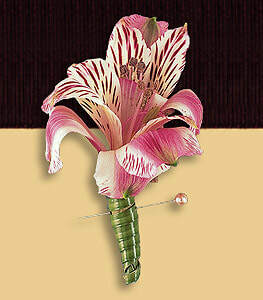 Boutonniere shown with optional ribbon wrapped stem, rhinestones and a feather. Cost of additional items varies. 2 sweetheart roses with fern and babies breath. Other colors available. One carnation with fern and babies breath. Other colors available. Double alstroemeria styles available with fern and babies breath. Other colors available. Mini Calla Lily with fern and babies breath. Other colors available. Visit our Prom Photo Gallery!